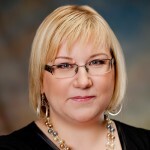 I am Krista (42), I have been working in accountancy 16 years and I am manager of Pilvebüroo. Purpose of Pilvebüroo (Cloud Office in Estonian) is to give practical help to people who dream about location-free business. And of course to these happy people who have this possibility already – working from summer cottage or foreign countries. We do provide accounting service through internet-based accounting program Margn and Dropbox. Most of our clients are small professional services companies who have some international dimensions (travellers or foreign clients). Price for accounting services is mostly between 79-349 euros per month.